On Tuesday, July 24, at 6:30PM we host Museum of Danish America exhibition curator Tova Brandt for a presentation on Scandinavian spirits and a tour of our new exhibition, Skål! Scandinavian Spirits. 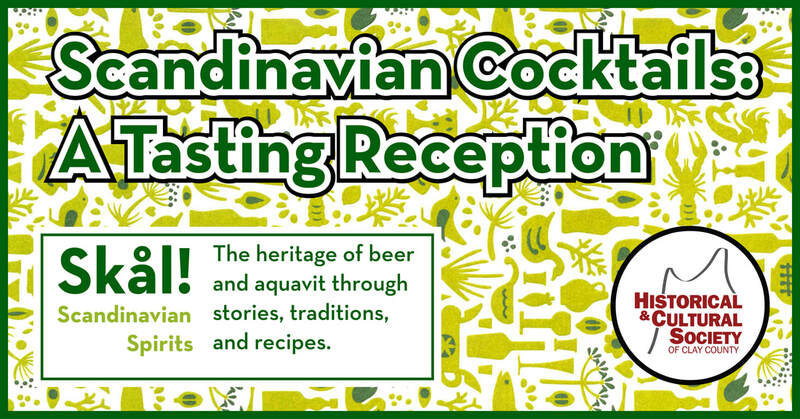 In addition, we’ll be sharing Scandinavian cocktails, heavy on the aquavit, from our friends at Proof Artisan Distillers. Focusing on beer and aquavit in Nordic countries as well as the migration of that culture across the Atlantic in the 19th and 20th centuries, Skål! Scandinavian Spirits serves as a fitting coda to our recent exploration of alcohol in the heavily Scandinavian Clay County, Wet & Dry: Alcohol in Clay County, 1871-1937. General admission is FREE. Refreshments will be served and a cash bar will be available.